Immigrant health and immigrant neighborhoods. Methodological reviews, commentaries and meta analyses. Our recent article in the American Journal of Health Promotion explores the association between New York City resident’s body mass index (BMI) and their access to neighborhood parks, park quality, and park physical activity resources. Our analyses show that higher residential neighborhood access to large parks (>6 acres) is associated with lower BMI scores. We measured neighborhood park access for ~13,000 residents of New York City whose height and weight had been measured and who had provided questionnaire data on their socio-demographic characteristics. 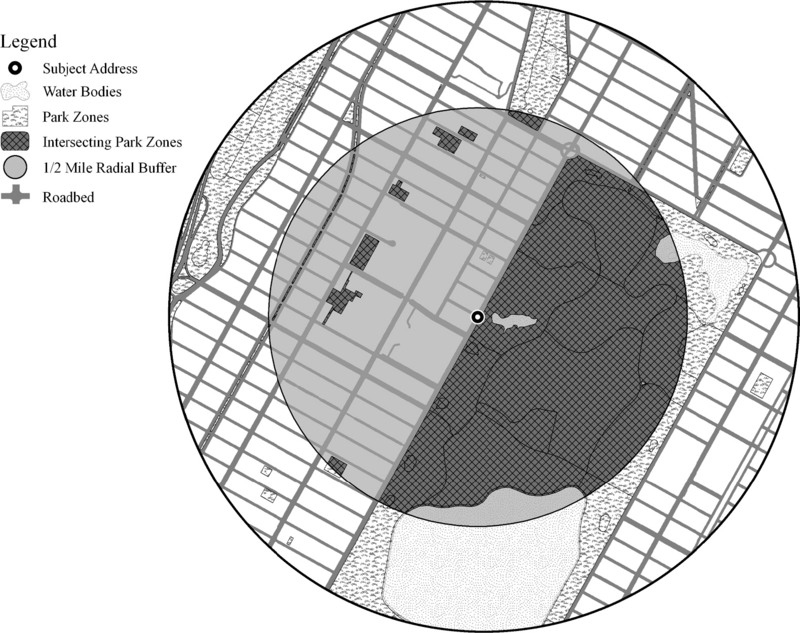 For each study subject we measured the amount of park space within a 1/2 mile of the home (see figure below), used NYC park inspection data to measure the cleanliness of the parks and measured the number of park based physical activity resources (e.g. ball fields, courts, trails) . While the cleanliness of the parks and the availability of physical activity resources in the parks were not associated with BMI, higher access to parks was associated with lower BMI. This entry was posted in Adults, Parks. Bookmark the permalink.